The Minnesota Vikings sealed their NFC North title with a dominating 34-7 victory over the Cincinnati Bengals. QB Case Keenum had another strong game, going 20-of-23 for 236 yards and two touchdown passes. RB Jerick McKinnon had 24 yards on the ground but led his team in receiving with 114 yards through the air. WR Stefon Diggs and TE Kyle Rudolph caught Keenum’s touchdown throws. QB Andy Dalton and the entire offense seemed to struggle on the day. Dalton went 11-of-22, throwing for only 5.1 yards per attempt and throwing two interceptions. RB Giovani Bernard led his team in carries and yards, rushing 14 times for 30 yards, also punching in the Bengals only score on the day. Edge defenders Brian Robison and Danielle Hunter got to Dalton for three sacks combined, and LB Eric Kendricks returned his interception for a score. With that, we give you our PFF-exclusive takeaways from the contest for each team. Outside of a misread early in that game versus Cover 2 that should have been picked by George Iloka, Keenum was on point all day. His stats benefited greatly from 186 of his 236 yards coming after the catch, but when the defense is given it to you for free, why throw down the field? It was a career day for the Vikings left guard. Besides two penalties, Easton was the Vikings highest-graded run blocker in the game and only allowed a lone hurry. 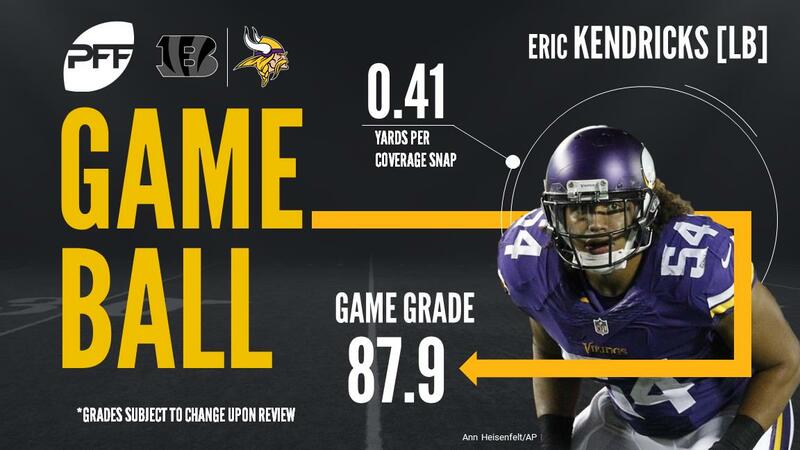 This was as good a game as Kendricks has played all season. He had the pick-six early to go along with two other coverage stops. On his five targets, he allowed all of nine yards. Newman got lost once on a crossing route to Brandon Lafell, but more than made up for it. He allowed only one of his other four targets to be completed while he picked off a pass and broke up another. This one was ugly from the start. Two drops didn’t help Dalton’s cause, but he was directly responsible for both interceptions. Both were slant routes that were bad reads for different reasons. On the pick-six he completely missed Eric Kendricks’ drop out from the A-gap into the throwing lane. On the second, he pulled an RPO to throw the slant, despite Terence Newman reading flat footed in off-coverage ready to break on it all the way. To beat the Vikings defense, one has to play perfectly and Dalton was far from that. For as bad as Cedric Ogbuehi has been this season, there was a reason Winston wasn’t playing over him. Winston allowed a sack and two hurries, but also had multiple other ugly pass-blocking snaps that didn’t result in pressure. Another ho-hum zero catches allowed day for Jackson. Guarding one of the most dangerous receiver duos in the NFL, Jackson was targeted once and was in position to breakup a crossing route to Adam Thielen that was overthrown. If there is any silver lining to this season, it’s been his play. Fejedelem was at the heart of a few busted coverages for the Bengals on the day. They struggled mightily dealing with running backs out of the backfield, yielding 102 yards after the catch to Jerick McKinnon.